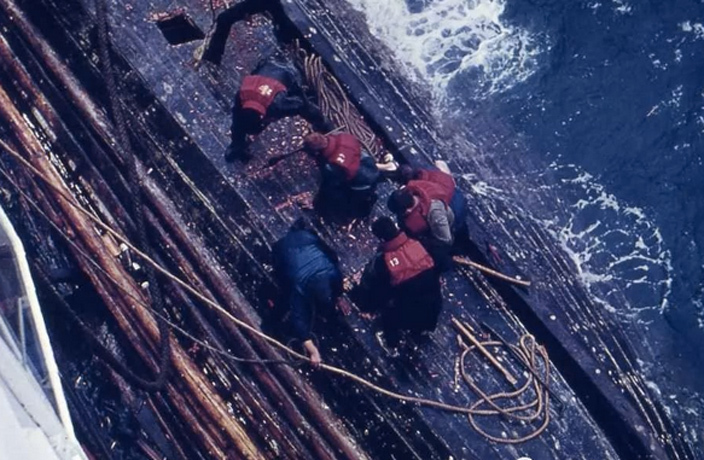 In 1966, 18 Chinese fishermen were rescued by a German cargo ship in the Taiwan Strait. Over 52 years later, Dieter Niemeyer, one of the brave crewmen on that German freighter, began his search to learn the whereabouts of the survivors today. After contacting the Consulate General of the Federal Republic of Germany in Guangzhou in August 2018, Niemeyer’s story spread across media outlets and successfully helped locate nine of the men still alive a half-century after the incident. Niemeyer and the surviving Chinese fishermen can still recall the story vividly. On March 20, 1966, 20 Dongshan-based fishermen set out for the high seas with the intention of bring home a sizable catch of fish. Unfortunately, things did not go as planned: on the fourth day of the fishing trip, their boat was slammed by heavy winds and torrential rains. On the evening of March 23, the crew received a weather alert that claimed heavy winds were inbound. With calm and quiet seas, the fisherman brushed off the warning and continued working into the night, planning to head back towards the port in Dongshan the following morning. At around 1am on March 24, the predicted storm arrived, bringing with it intense gusts of wind and unrelenting rain. The violent weather capsized the 30-metric-ton fishing vessel, trapping all but two sailors inside the bowels of the boat. The two fishermen lucky enough to avoid being trapped in the partially submerged vessel, Tian Xiaowu and Dong Chun, climbed onto the haul of the wooden boat. There, they rode out the storm in the black of night. At one point, while Tian and Dong were clinging on for dear life, the duo spotted lights from a cargo ship off in the distance. Due to the unfavorable conditions, though, the capsized boat went unnoticed by the passing ship. The following morning, as the sun began to creep up over the horizon, Tian and Dong spotted another ship heading towards their position. Niemeyer, a German sailor on that large ship, miraculously caught sight of the stranded fishermen and their half-submerged boat 300 meters ahead, and a rescue mission ensued. The German sailors were able to save all but two of the Dongshan fishermen, working tirelessly for six hours to extract them one by one from underneath the fishing boat. The bodies of the two sailors who perished in the storm were never recovered. After completing the rescue mission, the cargo vessel transported the surviving fishermen to Hong Kong. The rescuers parted ways with the Dongshan fisherman at Kowloon Port. The fishermen made it back to Dongshan roughly a week after being dropped in Hong Kong, reuniting with their families and loved ones after what must have felt like an eternity. Unfortunately, the two sides had no way of contacting each other after parting ways in Hong Kong. While both the Dongshan fishermen and Niemeyer often thought about each other, it wasn’t until November of last year that Niemeyer was able to learn that nine of the survivors are still alive today. Initially, both Niemeyer and the remaining Dongshan fishermen expressed interest in meeting one day, either in Germany or China. Unfortunately, we’ve learned from the consulate that old age will more than likely prevent either party from traveling across continents. On January 20, Niemeyer emailed a two-page letter to the German consulate in Guangzhou, which has been relayed to the fishermen. In his letter, Niemeyer recounts his experience those many decades ago, including the moment he discovered the capsized boat, and wished the retired fishermen a happy and healthy future. Here, we introduce you to the sights, sounds and tastes of Xiamen’s beautiful Gulangyu Island. Folks are being asked to stay out of the water at Baiyun Lake after a monstrous creature was spotted in the lake. We take a look back at some of the notable maritime disasters that have occurred within the Middle Kingdom’s borders during the 21st Century. These two tragic happenings come just one week after a mallet-wielding man turned up at a primary school in Beijing, injuring 20 students. After being downgraded from a super typhoon last night, Typhoon Maria arrived on the Chinese mainland this morning. The rich water-faring culture of the Tanka people has no institutional outlet for expression or preservation and has, in some places, faded.